Focalprice - is an online company offering technical equipment, electronics, computer accessories, video games, accessories for mobile phones and a large number of other things of Chinese production. It is known for its attractive prices and for some products they are considerably lower than DealExtreme. This is due to the store location, and specifically by its proximity to the manufacturers. The company has a very large range of products (over 70,000 items), including copies of notable brands, although judging by the comments, telephones and office equipment are of decent quality. To pay for the order different payment system can be used, like PayPal, WebMoney or some other. The company often holds a variety of events, and there are also discount coupons, the codes of which can be found on the Internet. Regarding the delivery, it is free, although, as it is typical for almost all Chinese stores, may be delayed (usually request comes no earlier than 2 weeks). When you make the order above $ 20, a track number will be assigned to your parcel to be traced on the post. Besides all this, FocalPrice provides warranty from an online store on all purchased products except parts and components to the electronics for a period of 12 months from the time when the delivery was made. Please note that the annual warranty will be valid only if the purchased product is returned to FocalPrice for repair work, but not to be replaced or refunded. In case you do not want to repair the product, and want to return the funds for the purchase or exchange it for an equivalent, then such refund shall be in a period of 90 days from the date of delivery - if such a term is larger, you can count only on repairing of purchased goods. It is necessary to take into account that the date of delivery from which FocalPrice counts warranty period is the date of dispatch of the order to the consumer and this date can be found in the account from the online store. Mobile phones, camer as, iPods, video games and laser pointers are covered by 12-month warranty. The other devices except for the parts to electronics, are given only 90 days for a replacement. Products that have been damaged by the user himself or due to misuse shall not be accepted to exchange, replacement or repairs under guarantee. 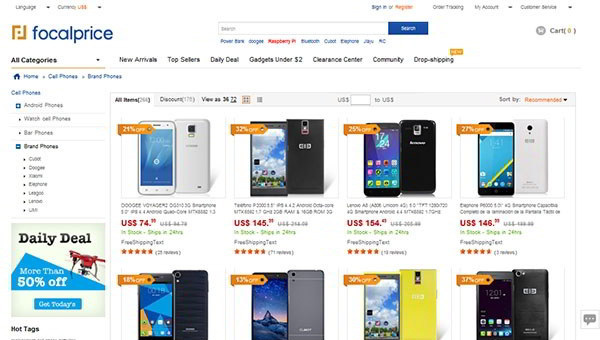 All the same it should be noted that the online store is located in China and despite the fact that the quality of the products out there is constantly growing, there may be some comments on its quality, which, in general, is offset by very low prices. FocalPrice and DealExtreme belong to various trade organizations that are competing with each other for the attention of consumers. DealExtreme is better known in the world due to the fact that it started to work much earlier than FocalPrice and managed to acquire loyal customers and reputation. Prices in the two stores are about the same for the same goods. Both in FocalPrice and DealExtreme delivery by airmail will not be charged. Because FocalPrice is now ready to expend more resources to attract customers, it is possible to find there much more advantageous price offers, as well as faster delivery and order processing. Besides all this, FocalPrice ensures the best price and is ready to lower the cost of the product in the case, when you tell the address where you've seen a lower cost than declared in the online store. As we can see now FocalPrice offers slightly better price and service conditions than DealExtreme as a whole.